So this weekend's gonna be dope... are you ready... it's B-Boy City 14... starting with King of Scratch tonight... see ya'll there. 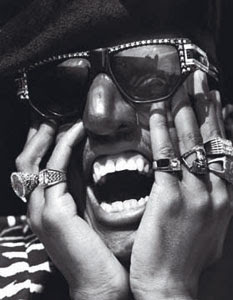 Digital Underground is an alternative rap group hailing from Oakland, California. This multi-member hip-hop group played a big part in giving West Coast rap the spotlight. Their leader was Greg “Shock G” Jacobs, who spent most of his youth in New York City and southern Florida. Heavily influenced by the various funk bands of the 1970s, Digital Underground sampled their music frequently, which quickly became a defining element of west-coast rap. Their ‘alternative’ status owes much to their unabashedly spaced-out image, which lay in contrast to the gangster rap that most west coast acts focused on. Album cuts frequently droned on until well over the five-minute mark, giving albums a jam-session feel (and likely, making radio singles hard to finger).